James Singleton recovering in hospital. James Singleton has been overwhelmed with the messages of support he has received following his leg break trauma playing for Northern Ireland under 21s on Tuesday night. The Glenavon man is still in hospital, in plaster, but is expected to have an operation later this week to have a pin inserted in the bone to help the healing process. The 20-year-old was earning his second cap for Jim Magilton’s side in their third Euro 2017 qualifier at Mourneview Park and sustained the injury when he moved in to make a clearance. It was obvious right away the injury was serious and after his left leg was put in a brace he was taken to an ambulance and on the hospital. 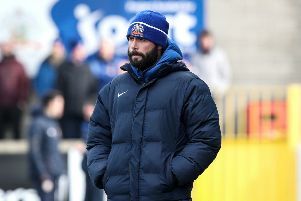 James could be out for some time, but is hoping to be at Glenavon’s game against Ballymena on Saturday to cheer on the team. “I’ll not be driving for a while, so Mark Patton will have to take over the driving duties,” added James.